Competitors are furious as city extends monopoly to Citi Bike for another five years. Many docks were completely full today. Oh great. Good for the environment I suppose. I am not a fan of these things. I prefer people who ride their own bike. Something about ownership (or lack thereof) makes people ride differently. Awesome. Can the mayor finally get over his aversion to taking parking so we can finally get a good set of usable bike lanes to go with this expansion? no. the reason they ride differently is because they have very low gearing and it does not feel like you are riding a normal bike. Hurray! Even though I was worried the city was going to abandon the system, I went ahead and purchased a membership–even though I live outside the current zone–after my own bike got badly vandalized. Private bike ownership is hard in a city that doesn’t provide secure bike parking–and I don’t work 9-5 or have an office, so bringing it inside during the day is not an option. So far the system is much better than I expected even with the current problems. It will be better still if I can ride it all the way home. There are lots of people who can’t get over the hurdle of buying and storing a bike they may never ride. Citibike lets them try it. I’ll bet 2/3 or more of those riding Citibikes would not have used bicycles for transportation in its absence. So this will drastically increase the number of people giving it a try, some of whom will eventually buy bicycles of their own. Hey Motivate, health insurers subsidize health club memberships if people can demonstrate they use the exercise facilities. The big play for bicycling is to get those health insurers to pay for Citibike memberships, since Motivate could document who rides and how much. And once people sign on, the goal of having the service be free would be a big motivator to actually use it. Motivate could probably send out alerts to push people to ride more if they might come up short. This is obviously a great thing, but I’m not so sure giving Citi Bike exclusive rights over their operating zones is a good idea. Even with the expansion, Citi Bike may not reach all the neighborhoods in the outer boroughs that could benefit from bike share. Jump and Lime might not want to operate in the city if they are only allowed to be in the outlying areas of the city. This could mean that the neighborhoods that are still left out of this Citi Bike expansion would have to wait at least five years for bike share. I hope Citi Bikes monopoly doesn’t extend to scooters. fyi, I just learned (by accident) that City employees who are in the Management Benefit Fund can have their City Bike fee paid for in the same way that gym memberships are reimbursed. Is there a map showing where they are planning to expand? This needs to get to Jax Heights! Right now the closest dock is 1.9 miles away and thanks to the subway madness there have been days where I have biked home from Manhattan instead of taking the train, docked there and walked. I just found out yesterday that Amtrak now allows a limited number of bikes on selected trains, without them being disassembled and boxed. Really, there aren’t a lot of positive trends in U.S. society in the wake of Generation Greed. This just in. The ultimate statistic, the one you can’t really argue with. Ride a bike, get together with other people who ride bikes, extend and improve your life. Not sure about the prefer thing? I mean a person getting around by bike is a person getting around by bike. I see people ride much less recklessly on Citibike than the average rider. They are heavy and don’t go fast. But safe too. I ride both my personal bike and Citibike. I agree, I’m such a fan of the train&bike getaway. I’ve been waiting for years for Amtrak to accept bikes on the Adirondack. Whenever they do, it’ll be fantastic. For now I either take a folding bike for this line, or Amtrak accepts full-size bikes up as far as Schenectady on the Lake Shore Limited. There’s pretty good CDTA bus service with front bike racks between SDY and Saratoga Springs, although it’s hard to get from Albany to Saratoga on transit with a bike. Anyway, long digression! Thrilled for the Citibike announcement. Can’t wait to see this up and running. I don’t ride differently except for more slowly. I used to have my own bike, but lugging it up and down 3 flights every time I wanted to go anywhere, worrying about parking, lugging the giant lock required to keep it safe everywhere, getting it fixed all of the time, having the lights and seat stolen… good riddance! Another plus of Citibike is using it for one way journeys. I love it for that. I’d say at least half of my rides are one-way. Very much looking forward to the expansion. I wish a few million of their commitment went to advocacy for PBLs. There are so many terrifying places for people on bicycles. Needs to change asap. Yeah, I am much faster on my own bike than on a city bike. Only the electric citibikes can compare in overall speed to my personal bike. I, too, prefer people riding their own bikes, just because they are faster and easier to ride around than the slow citibikes. But I much prefer a person on a citibike than any other form of mechanized transportation. My primary use of citibike is for one way rides as well. I almost never end up doing a round trip with citibike. I am also more apt to stop in a store or run an errand while on citibike than on my own bike. While bikeshare can and is certainly used for commutes to Midtwon, there are a lot of other regular use cases for bikeshare. Many commutes cut akwardly across the city, where taking transit is awkward and requires multiple transfers or slow/infrequent service. Bikeshare can knock out a transfer or two for a lot of trips. Many of these reguar trips have nothing to do with Midtown. With a larger service area and more bikes, the number of potential uses grows exponentially. 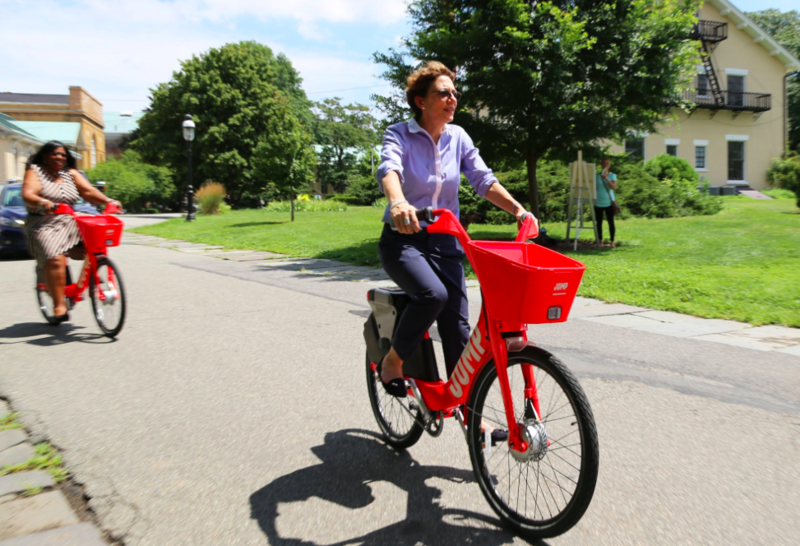 When you add e-bikes, it get even bigger and is open to more people. It’s really important that the editor of Streetsblog understand this. 100% agree – I have often Citibiked from Chelsea only to have to dock it at Queens Plaza and take the 7 or the Q66 to Jackson heights both of which are overcrowded, unpleasant and slow. I would love to Citibike all the way! I hope the venture capital continues to fund Lyft for the sake of LyftBikes. If it doesn’t, I’m afraid what will happen to it. Coward de Blasio isn’t gonna take on parkers any more than he’s gonna take on the NYPD. Whatever the opposite of backbone is, he has that. If anything, I find Citi Bikers slower and safer than the average cyclist. The idea that they’re somehow more dangerous or reckless seems completely overblown and not supported by any data. I agree to some extent, but I think the city should kick in the funding to expand the program city wide. It’s been proven to be a massive success, and even if the outer boroughs require some level of subsidy, giving every NYer access to this is worth it. Statics show that bike share bikes, pretty much everywhere they exist, have lower injury rates than for bikes in general. I’d be willing to infer that low injury rates for riders also translates into lower rates for non-riders injured by bikes. -Inwood (I can’t see them not covering the last bit of Manhattan Island). And considering double the coverage area, I would say maybe as far east in Queens as Corona, as far south on Brooklyn as Canarsie-Bay Ridge, and as far north in the Bronx as Norwood, maybe east to Castle Hill. NYC sounds so much more amazing in like 2030. Maybe the most densely populated zips in Brooklyn, Queens and the Bronx can get CitiBike? Wait??? 11372 is the most densely populated space in Queens? When the heck are we getting Citibike? YES!! There should be a dock on every block in midtown manhattan. But adding up the fiscal numbers, checking the demographics, and extrapolating existing trends, biking may be the only thing that is much more amazing in 2030. The components you want have to become profitable. That’s what has to happen. The rest will sink away. Not talking about injuries. Talking mainly about decorum, sharing space in a civilized manner, etc. Well, for now anyway. I guess LIC and DT Brooklyn might catch up. Based on the recent unpleasantness with the Dyckman Street bike lanes and pedestrian bulb-outs (RIP), I can easily see them not bothering to go north of 190th Street. Can you imagine the CB12 meeting when they try to propose taking away some parking spots to put a dock at Broadway & Dyckman or even Sherman & 207? I gave up my membership and am not coming back until they replace the dock at 56th St and 6th Ave that they removed when Trump was elected. There is simply not enough space to park in that part of midtown and I was forever searching for a dock space. there should be no way fifth avenue from 57th to 45th should have private cars. It should be pedestrianized with 2 bus lanes to Protect our President !!!!!! Besides, strictly as an engineering matter, Inwood is hilly to get to and way past the no-extra-fee commuting distance of Citibike for most destinations (workplaces, educational campuses, etc.) Maybe once the GWB riverfront bypass is in place, or once Ydanis’ fantasy office buildings that he just rezoned (read: destroyed) eastern Inwood for happen it could be revisited. Well, Broadway Bridge actually does start a 3-year reconstruction this spring (note to all inter-borough toll-dodging drivers – stay the #$!%!^ out of Inwood, please!) and apparently the rebuild will include bike lanes that continue on Broadway — I’m guessing spitj to about 218th St, where the sharrows route heads west to the Seaman Ave sharrows/lane. 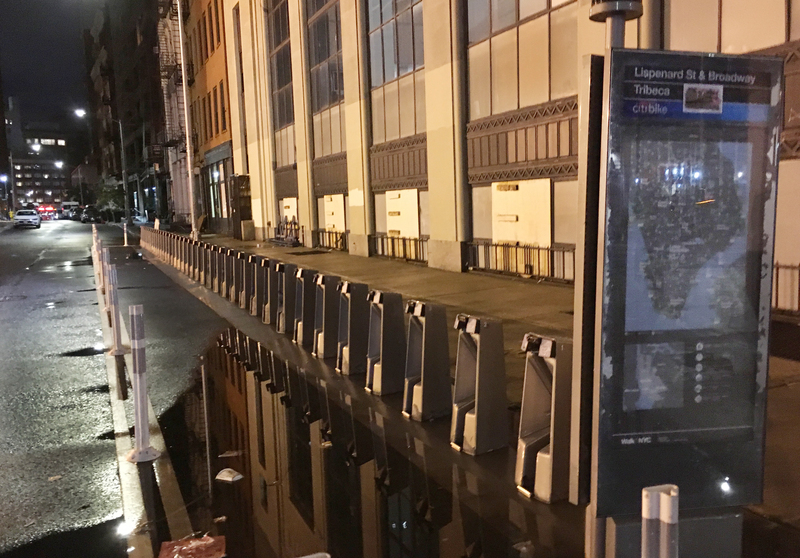 But the bigger point is that bike sharing needs good intermixing of arriving and departing traffic, unless you want to have zero bikes during the day or get so flooded you need a valet. Inwood lacks destinations, so any dock of 10 bikes would likely empty out at am rush and not come back until pm rush, much as happens in some outer parts of the network now. It’s supposed to be bikes usable all day for any number of reasons, not a one-way commuter subsidy. Hey, we have the Dyckman Farmhouse! Er… okay, point taken, although I think the same honestly applies to any neighborhood north of 150th except maybe whatever station ends up immediately adjacent to the Cloisters. Great news about the Broadway Bridge renovation though. I’ve taken my kid up to the VCP bike lane a few times now and it’s a really nice ride…once you dodge death multiple times in the process of getting there. I’d say NYP Hospital is a major destination north of 150th St.